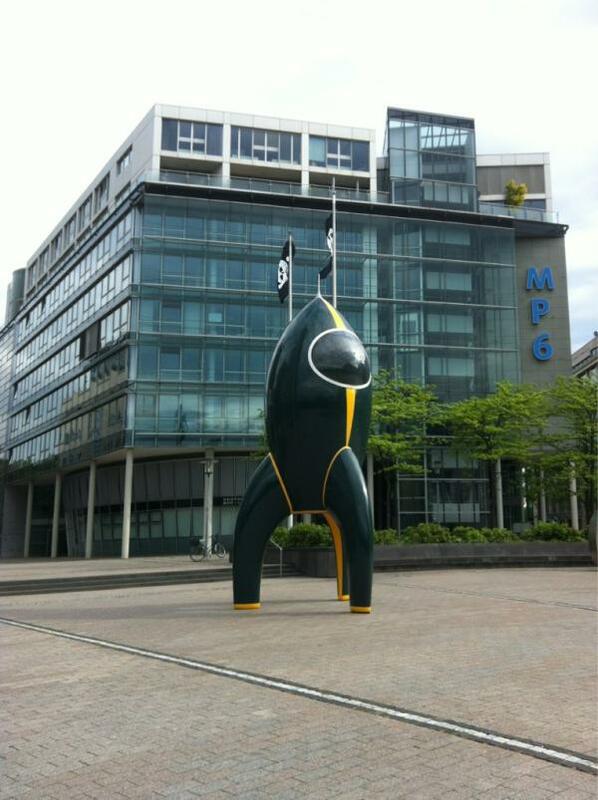 This year I made it to the Sigint in Cologne/Germany. It is the third Sigint organized by the well known CCC (Chaos Computer Club). Since the congress at the end of the year in Berlin (28C3) became really big I am not so interested in it anymore. But Sigint is much smaller and the talks are really nice and some times an earlier version like at the end of the year. It is nice to see the Geek-sphere is so active and well organized in Germany. That's what for we Germans are known. Even when the organizing Club has chaos in its name and it's mostly done in the spare time of its members, the congress has a professional geeky image. A lot of LED and light art is shown and there is a lot of space to sit down and do some writing or hacking. The first Image I shot in the early morning while making some walk around the area shows the rocket which is related to the goal to create private hacker space projects over the next years. There is also a lot of work with autonomous quadcopter done by people who are sharing there knowledge and experiences with others. This shows how many potential the hacker scene has. The sceptic behavior against governmental organizations and the trust in the own open way of doing things makes this community one of the most powerful think tank of human race this centuries. The spirit of sharing knowledge and developing technologic solutions based on open hard and software has become a place of doing things in a different way. It's amazing to the people spending hours and hours on projects with often no other direct profit than fun with the technology. Since a few years the German governmental institutions sending some questions to the CCC to ask them for there opinion for example how data should be handled by companies like Facebook or Google which make money out of analyzing private data. Since the last 1-2 years this community is starting to grow faster but healthy. More people are interested in the tools affecting there lives in such a big way. Searching for a restaurant, planing a trip or connecting with friends has become normal in the internet. Even very private data is shared by the youngest generation of users. For a lot of interested people this is a motivation to have a look behind the HTML/CSS sites or nice looking user interfaces to see how things are working. And hopefully they start to do it a better or different way and share there information about there improvements. This generation are the new Fords, Benzes, Edisons or even Einsteins. Don't believe that things don't work in a totally different way. Don't believe in companies who tell you this is not productive or you never will make money out of a solution. Just remind that Google makes it's money by finding things. Yes they do it in a clever way and with a lot of improvements over the last 10 years. But at the end of the day they started there business with searching databases and crawling the web for you. Let's make the world a better place and start getting active. Start working on a project, make your work public and maybe if it's what you want to make for living start a business, found a company or just have fun with hacking. * How and where do I publish my project? * Why should I make my code, plans or ideas open source? This information maybe helps you to find your way in getting things done the new way.